BaRMIe is a tool for enumerating and attacking Java RMI (Remote Method Invocation) services. RMI services often expose dangerous functionality without adequate security controls, however RMI services tend to pass under the radar during security assessments due to the lack of effective testing tools. In 2008 Adam Boulton spoke at AppSec USA (YouTube) and released some RMI attack tools which disappeared soon after, however even with those tools a successful zero-knowledge attack relies on a significant brute force attack (~64-bits/9 quintillion possibilities) being performed over the network. The goal of BaRMIe is to enable security professionals to identify, attack, and secure insecure RMI services. 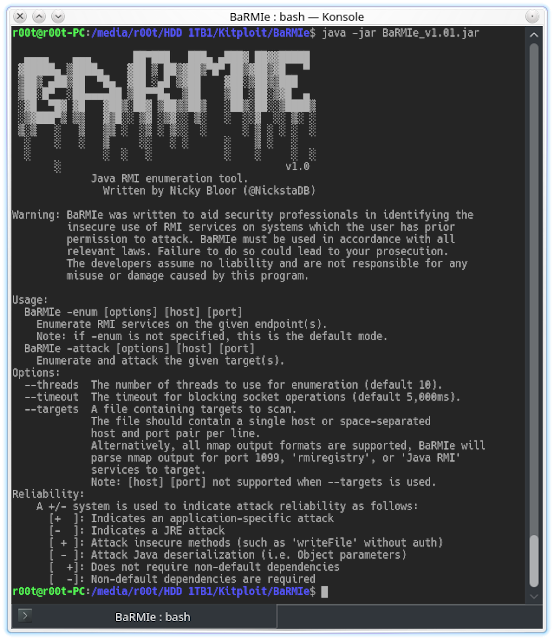 Using partial RMI interfaces from existing software, BaRMIe can interact directly with those services without first brute forcing 64-bits over the network. BaRMIe was written to aid security professionals in identifying insecure RMI services on systems which the user has prior permission to attack. Unauthorised access to computer systems is illegal and BaRMIe must be used in accordance with all relevant laws. Failure to do so could lead to you being prosecuted. The developers of BaRMIe assume no liability and are not responsible for any misuse or damage caused by this program. Use of BaRMIe is straightforward. Run BaRMIe with no parameters for usage information. relevant laws. Failure to do so could lead to your prosecution. misuse or damage caused by this program. Enumerate RMI services on the given endpoint(s). Note: if -enum is not specified, this is the default mode. Enumerate and attack the given target(s). --threads  The number of threads to use for enumeration (default 10). --timeout  The timeout for blocking socket operations (default 5,000ms). --targets  A file containing targets to scan. host and port pair per line. Note: [host] [port] not supported when --targets is used. Enumeration mode (-enum) extracts details of objects that are exposed through an RMI registry service and lists any known attacks that affect the endpoint. Attack mode (-attack) first enumerates the given targets, then provides a menu system for launching known attacks against RMI services. A single target can be specified on the command line. Alternatively BaRMIe can extract targets from a simple text file or nmap output. Great! This is your opportunity to help improve BaRMIe! BaRMIe relies on some knowledge of the classes exposed over RMI so contributions will go a long way in improving BaRMIe and the security of RMI services. If you have access to JAR files or source code for the target application then producing an attack is as simple as compiling code against the relevant JAR files. Retrieve the relevant remote object using the LocateRegistry and Registry classes and call the desired methods. Alternatively look for remote methods that accept arbitrary objects or otherwise non-primitive parameters as these can be used to deliver deserialization payloads. More documentation on attacking RMI and producing attacks for BaRMIe will be made available in the near future. Alternatively, get in touch, and provide as much detail as possible including BaRMIe -enum output and ideally the relevant JAR files. BaRMIe is capable of performing three types of attacks against RMI services. A brief description of each follows. Further technical details will be published in the near future at https://nickbloor.co.uk/. In addition to this, I presented the results of my research at 44CON 2017 and the slides can be found here: BaRMIe - Poking Java's Back Door. The parameters to each of these methods can be replaced with a deserialization payload as the method invocation passes through a proxy. This attack is possible because Java does not attempt to verify that remote method parameters received over the network are compatible with the actual parameter types before deserializing them.